(L-R) Filinvest Land, Inc. marketing manager Kat Mercado, Filinvest City and City di Mare senior project development manager Dolly Macam, and IL Corso deputy mall manager and marketing manager for Filinvest Lifemalls George Calles pose in front of IL Corso at the media briefing on City di Mare’s partnership with MyBus. FLI has entered a landmark partnership with Metro Rapid Transit Service, Inc. (MRTSI) to have MyBus routes that will have multiple stops within the City di Mare township in the South Road Properties (SRP). With this, the 50-hectare masterplanned seafront development is now connected with the rest of the city through MyBus. We got to try the new routes at a media preview by Filinvest with members of the Cebu media. The premium point-to-point bus service has been available for residents, visitors and the general public since September 1. 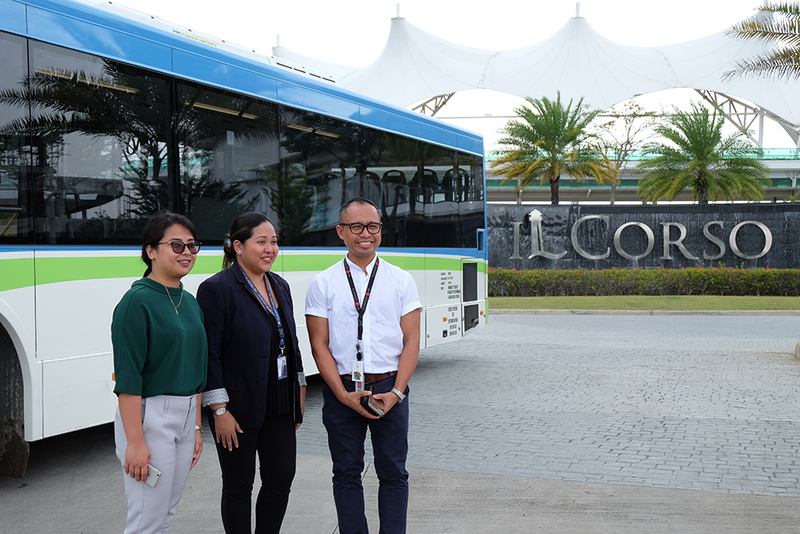 The air-conditioned, PWD-friendly, CCTV-enabled buses are now available to residents, locators, and the general public, with stops at City di Mare Visitor Center, Sanremo Oasis, Amalfi Oasis, the UP Professional Schools, and IL Corso the only alfresco waterfront mall in Cebu. This development connects City di Mare to five existing MyBus routes that cover as far as Talisay City in the south and the Mactan-Cebu International Airport in the north. MyBus trips from City di Mare to SM City Cebu are at 6:30AM, 7:30AM, and an interval of two hours thereafter. From SM City Cebu, riders can transfer to other buses heading to the airport and all bus stops in between. From SM City Cebu, trips to City di Mare are at 6AM, 7AM, and an interval of two hours thereafter. Buses from SM Seaside City Cebu to Talisay, that will have stops within City di Mare are scheduled at 10:40AM, 12:40PM, 2:40PM, 4:40PM, and 6:40PM. Buses from Talisay to SM Seaside City Cebu, that will have stops within City di Mare are scheduled at 10:20AM, 12:20PM, 2:20PM, 4:20PM, and 6:20PM. You may check out the complete schedule on MyBus’ Facebook page. As an integrated lifestyle destination, City di Mare promotes a live-work-play lifestyle. Dolly Macam, senior project development manager of Filinvest City and City di Mare, and Kat Mercado, marketing manager at FLI took us through the latest progress in City di Mare and what’s in the pipeline. Currently, the two residential projects at City di Mare – the Amalfi Oasis and Sanremo Oasis, already have a community of around 600 families. The properties are also popular for Airbnb transients. Groundwork will soon start on the rest of the area which will have high-rise structures including more residential buildings and business process outsourcing (BPO) towers. Christmas season is arguably when Filipinos spend most of their hard-earned money. Retail outlets register their highest sales during this season. With this in mind, Filinvest is on track to open a phase of IL Corso by December 2018. Two restaurants – Gusto Mare, and Parilya, have been operating at IL Corso for quite some time, and more will be joining them at the 10-hectare alfresco and waterfront mall of Filinvest soon. Some of the brands that are expected to open before year-end are Dessert Factory, Coffee Bean and Tea Leaf, Chikaan, Dunkin Donuts, Jonie’s Flavored Chicken, Dolce Milano, Power Mac Center, 360 Pharmacy, Ace Hardware, and Skintech, among others. IL Corso deputy mall manager and marketing manager for Filinvest Lifemalls George Calles shared that they are also looking to open four cinemas at the IL Corso by December, in time for the Metro Manila Film Festival. By next year, they will be opening another phase of IL Corso which will house some of their anchor stores including Rustan’s Supermarket. There are also rumors that Decathlon, the largest sporting goods retailer in the world, is opening at IL Corso. Decathlon’s first outlet in the country opened at Filinvest’s Festival Mall in Alabang.